Review Context: I am no stranger to interactive adventure games; I have played and completed Heavy Rain, Beyond: Two Souls, The Walking Dead, and The Wolf Among Us. 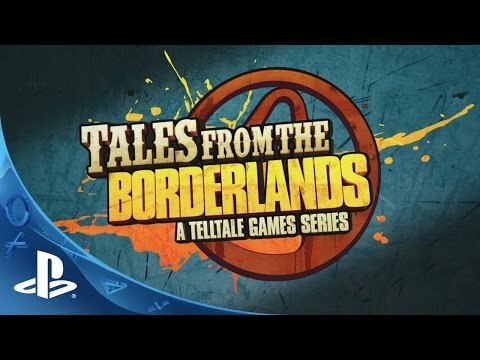 The good folks at Telltale Games are at it again; this time teaming up with Gearbox to bring us a rather unique Borderlands experience, with storytelling overshadowing the first person shooter and RPG elements seasoned Borderlands players are used to. 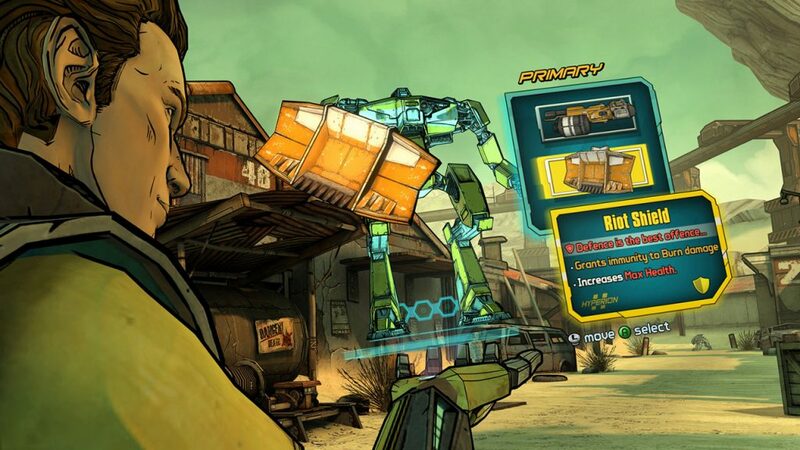 Being a Borderlands fan myself, I must admit I was quite skeptical when I first heard about this project; the type of games they are known for just did not seem to fit in with the high action, guns blazing gameplay Borderlands is known for. However, I decided to give them the benefit of the doubt seeing as how they have multiple video game awards under their belt. The first episode in the series dropped recently and was able to play it in it’s entirety. So did this risky project garner positive results or was it a terrible train wreck? Let’s find out. 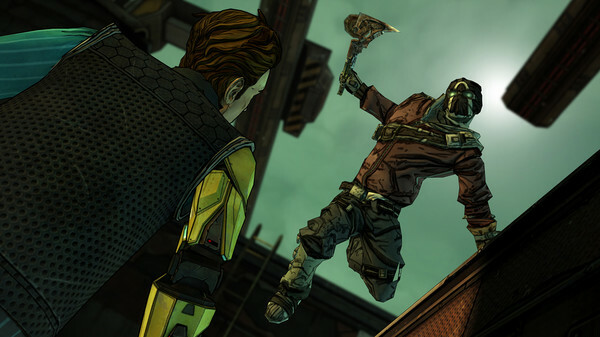 The first episode of Tales From The Borderlands revolves around two Characters: Rhys and Fiona. They share absolutely nothing in common but they cross paths due to the endeavors they partake in. Rhys is a company man, he works for Hyperion; a company known for producing robots and high-class weaponry. With the help of his two best friends, Vaughn and Yvette, Rhys has been working hard in hopes of getting a promotion from his boss. Due to an unforeseen event, things do not go as planned, so he carves up a rather risky plan which could make him rich if successful. Fiona grew up in a dangerous town called Pandora along with her sister Sasha. A man named Felix caught them trying to steal from him. Instead of punishing them, he decides to raise them into a life of crime. Together they were thieves and con-artists, scamming people and earning a profit in the process. During her next venture, her and her crew coincidentally find themselves teaming up with Rhys, and what unfolds next is a high octane thrill ride which would make Michael Bay proud. Unlike the past Telltale games, humor is at the forefront; The tone is far less serious this time around and I found the quippy dialoque hilarious and entertaining. Anyone who played borderlands 2 will be right at home with the outrageous character designs and the diverse personalities you come across in this game. But what good is humorous dialogue without solid voice acting? Fortunately, Telltale games also brought out all the stops in that department; thanks to talented voice actors such as Troy Baker, Laura Bailey and Chris Hardwick, who bought these characters to life with grade A performances all across the board. The soundtrack is also worth mentioning; I especially found that the heavy metal sounds meshed well with the adrenaline filled segments I found myself involved with in the game. All the sounds, from the solid voice acting, to the dynamic soundtrack, hit all the right notes and I highly recommend playing this game with a pair of good headphones or an adequate gaming headset to enhance your experience. When it comes to the game’s graphics, the same cartoon/comic book style from past Telltale games is used and it’s the right choice for a game bursting with so much personality. The character models are on point, and the animations are solid but what wowed me the most was the level of detail found in the game’s environments. I especially loved the Pandora’s desert; this environment was beautifully detailed, and interacting with the bandits and skags that inhabit it was a nice touch. All in all, the graphics fit this game perfectly and if you have played past telltale games, you should have no problem adjusting to them. As far as the gameplay is concerned, there are some features worth noting. For one, this time around you take control of two characters during different segments of the game. Rhys has several interesting abilities; he has an echo eye implant which he can use to scan and analyze various items and people around him. The echo eye implant can also download and decrypt information from computers and other machinery. He also possesses a stun baton emitting electricity which can come in handy during close combat. Fiona relies more on her wit to get the job done but she does keep a small gun hidden just in case things get hairy. During her segments, you get the opportunity to loot certain crates and even buy some cool stuff. Although this idea was cool, I found that it was not utilized enough and therefore felt more like an after thought. One standout moment for me was being able to deploy and command a hyperion robot. This robot can be equipped with cool weapons such as large machine guns and missile launchers. What made this so fun was that the tried and true quick time event formula was temporarily replaced with more direct player control. I was able to aim at shoot at bandits and the amount of destruction I laid out was oh so satisfying. That is not to say that the quick time events were poorly implemented; for the most part, they were used in crafty and clever ways and that goes a long way considering all the hectic action that that takes place throughout the latter half of the episode. In my personal opinion, this episode was awesome; it was engaging and funny, it had very likable and interesting characters, solid voice acting, exciting action and a great soundtrack. The only complaint I have is that I want to see the currency system used more effectively in future episodes. This episode hit all the right notes and the surprise character appearance at the end left me very eager for the next installment. I would recommend this game for anyone looking a narrative driven adventure game or a game with lots of humor. So when it’s all said and done, episode one was a definite success, but there are still four more episodes to go and that momentum could always shift in the wrong direction. I will keep my fingers crossed in hopes the future episodes will be as hilarious and engaging as this one.